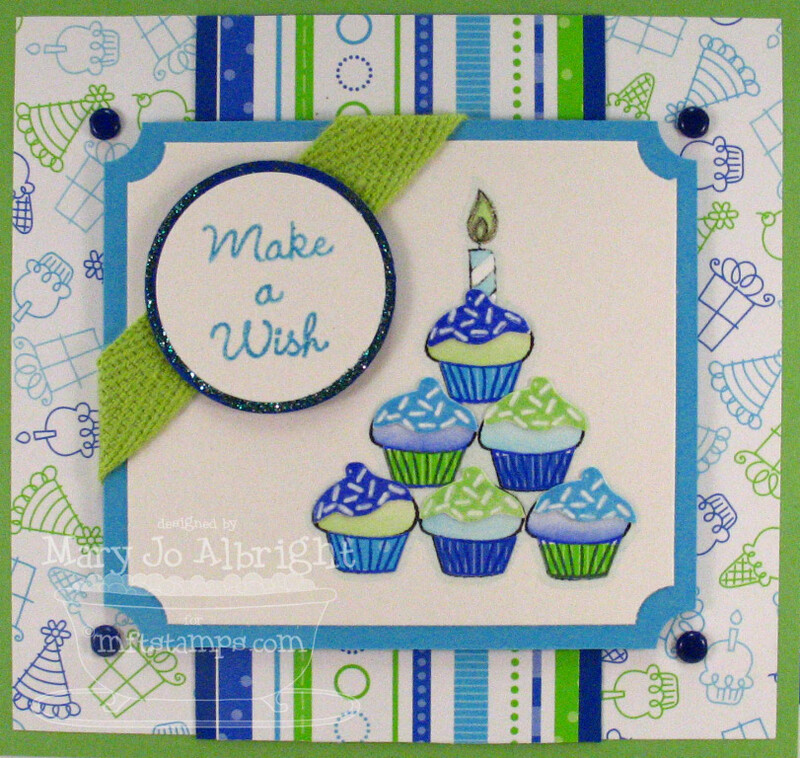 Lots to share in this post: Taylor’s cupcake challenge, taking a card front and converting to a scrapbook page or large card, and a chance to win a stamp set. Let’s start with Taylor’s Cupcake Challenge. Ahhh, I got to use are really cool color combo and patterned papers for this one! I can’t say that I have used SU! Brilliant Blue or Green Galore in the past year (or more..lol). It was fun playing with these bright vibrant colors for the sketch. How fun right? Aren’t those cupcakes the cutest? 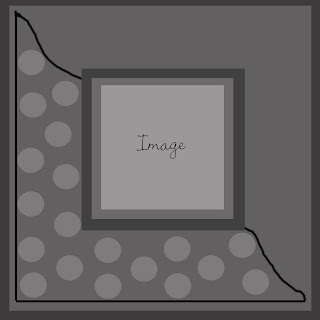 Remember, you don’t have to use cupcake images to participate in the challenges:) I fell in love with this paper when I saw it. Boyish, but can also go to anyone I think. 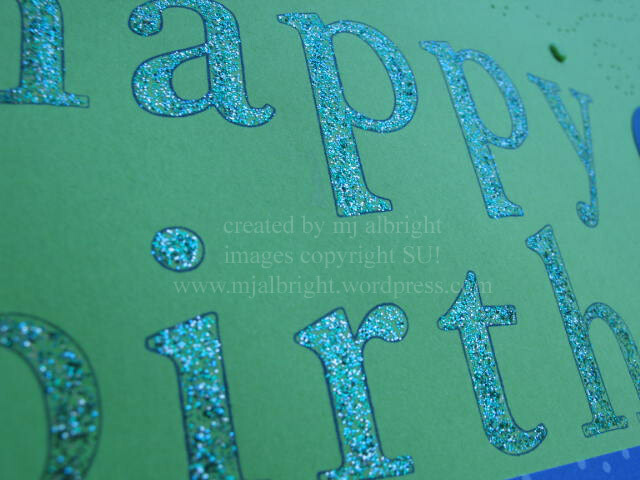 Now, how about making it a jumbo card or a 8-1/2 x 11 birthday section title page for a scrapbook. I placed additional coordinating patterned paper to the outside of the card, added a title, some whimsical details, and think it turned out okay. For the title, I used SU! Jumbo Outline Alphabet and filled in with Aqua Stickles. 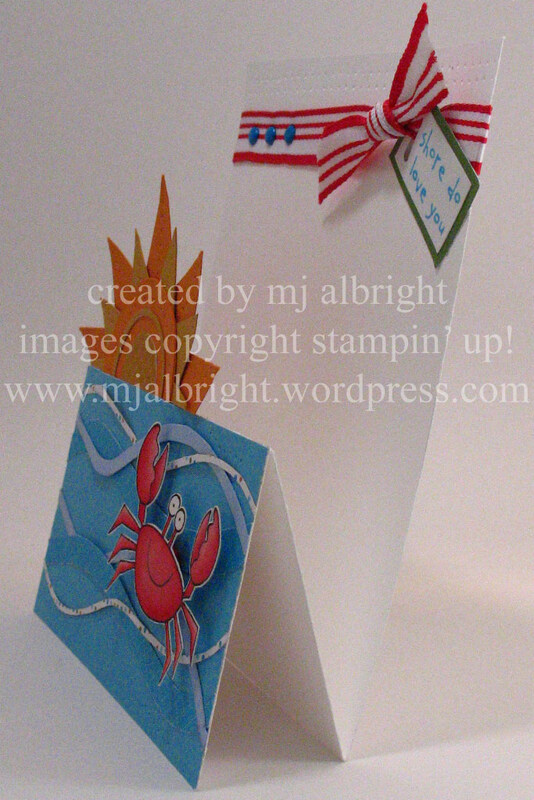 I love my stamp-a-ma-jig tool…if you are a perfectionist, it is a must have handy tool. For the whimsical pattern flowing across the page, I used an assortment of circle punches, paper-piercing, and coordinating brads. I added dimension to some of the circles using foam adhesive. And the featured cupcake sampler for the challenge this week is from Carol at Happiness Blooms. 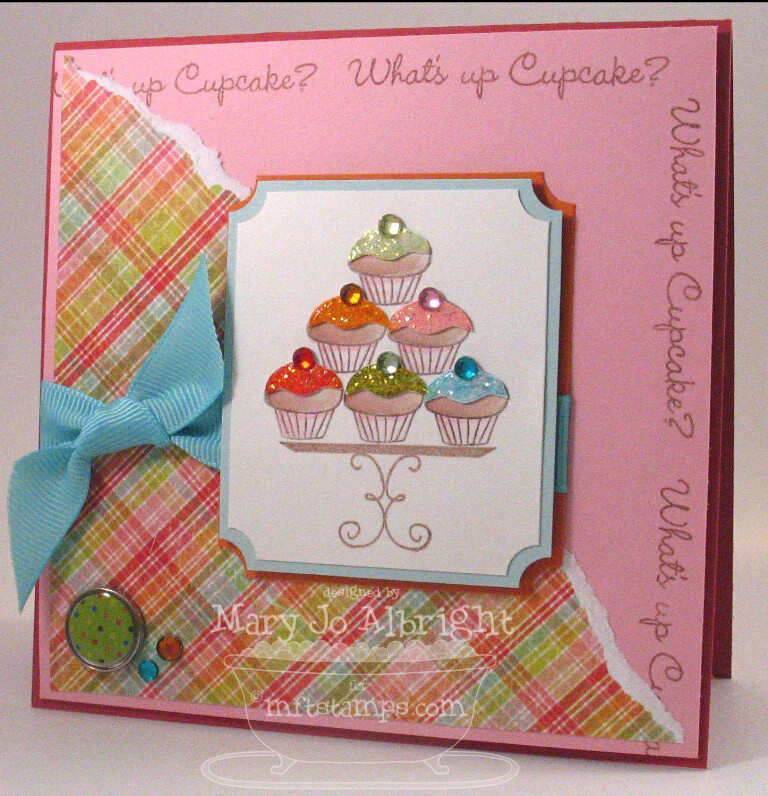 WANT TO WIN THIS MFT STAMP SET CALLED “WHAT’S UP CUPCAKE?” THAT IS DUE TO BE RELEASED IN JUNE? LEAVE A COMMENT AND I WILL DRAW A WINNER ON MONDAY EVENING USING RANDOM.ORG. PP: Doodlebug Design Inc. Birthday Boy party time, ring toss, and ribbon stripe. INKS: Stazon Jet Black & Opaque Cotton White; SU! Brillliant Blue, Green Galore, and Tempting Turquoise. TOOLS: stamp-a-ma-jig; su! mat pack, ticket corner punch; 1/2″, 3/4″, 1″, 1-3/8″, and 1-1/4″ circle punches. Happy Friday! That means it is time for another one of Beate’s wsc…..#50 that is! Always good to have a baby card handy. 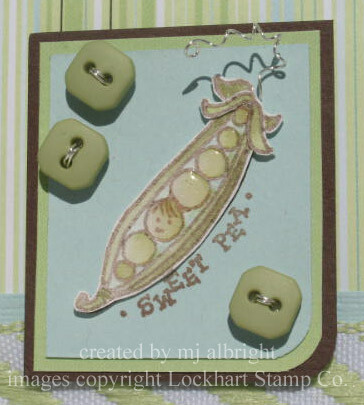 I thought I would use this sweet pea in a pod image from Lockhart Stamp Co. Also wanted to use this cute silver rattle charm. I carried the “silver” theme throughout the card for balance. For the pea image, I actually stamped the image twice so that the top of the pod had more dimension to it (I know they aren’t called leaves, but the 4 little “stemy-things” at the top — I stamped, colored, adhered the upfront 2 of the 4 so it appears more realistic..KWIM). I masked and omitted the stem for the pod because I wanted to create it with silver wire. The buttons have the silver wire as well. Added a touch of Crystal Effects to the little peas for the finishing touch to the main image. 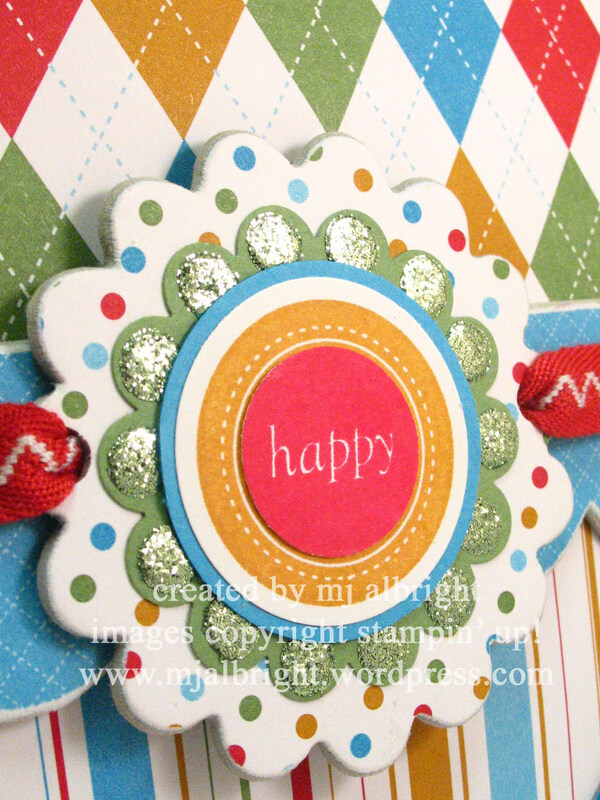 Here is an upclose of the charm, ribbon, dry-embossed circles, and scalloped textured cardstock. I like all the subtle different textures on this card. 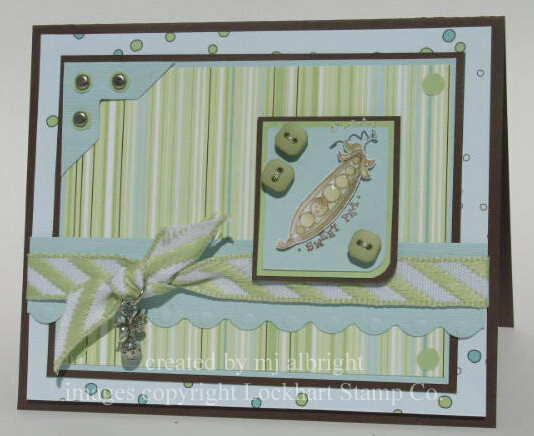 STAMP: Sweet pea in a pod from lockhart stamp co. 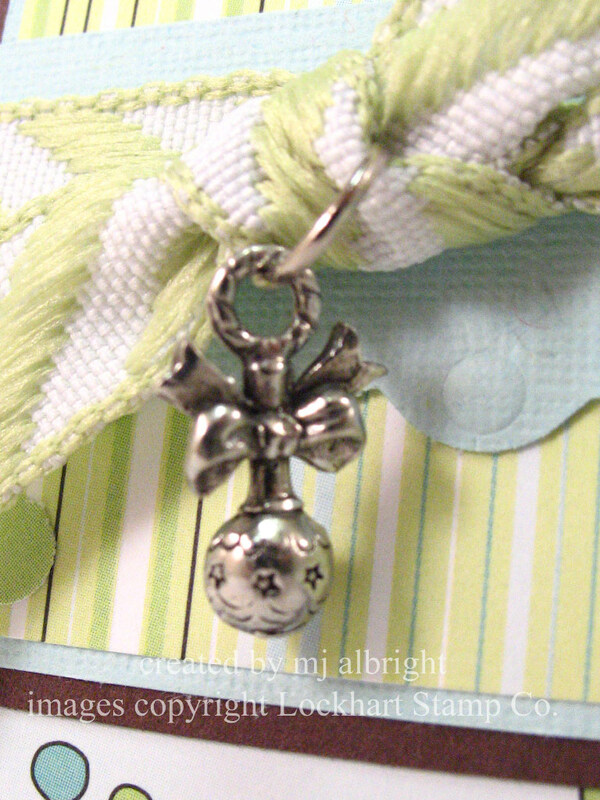 ACCESSORIES: rattle charm from boxer scrapbooks; foam tape adhesive; SU! district ribbon originals, silver brads, fresh favorites I colored buttons, crystal effects, silver wire. I had to give Lauren Meader’s sketch a try. Love all the dimension to the layout of her sample. With my little Ethan starting swimming lessons today, I had to go with a fun water theme. Ethan is a fish. I can’t turn my back for one minute (as no pool owner should). We even have our pool 100ft away from our house with its own fence and double locks on the gates. I still can’t trust Ethan. So, swimming lessons it is. See what I mean…no fears. 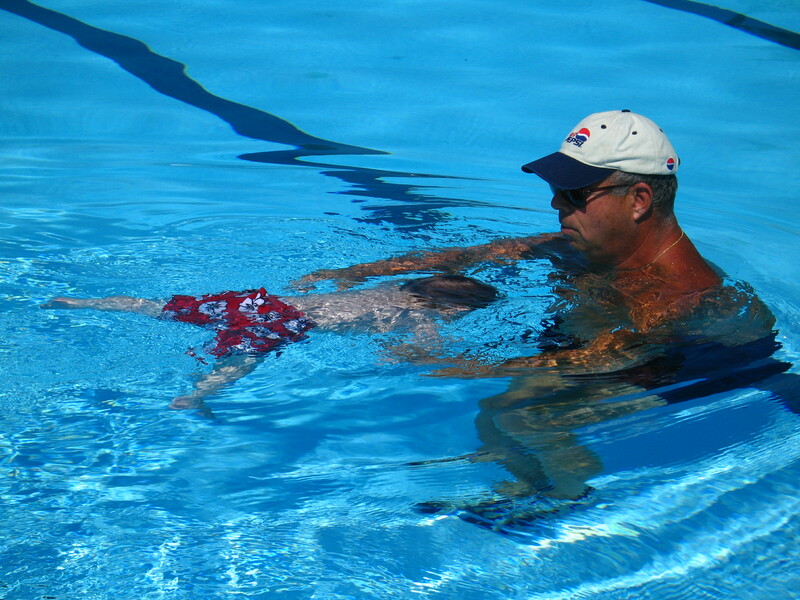 This instructor taught the kids to hold their breath and go under. As where his current instructor teaches the kids how to float before anything else is taught. He makes me so proud:) You must remember that swimming lessons don’t save lives….Parental supervision is still a must. This sample is also a “tilt card”. Charmaine Ikach created a tutorial on scs if you are interested. What that means is that cute little crab turns. 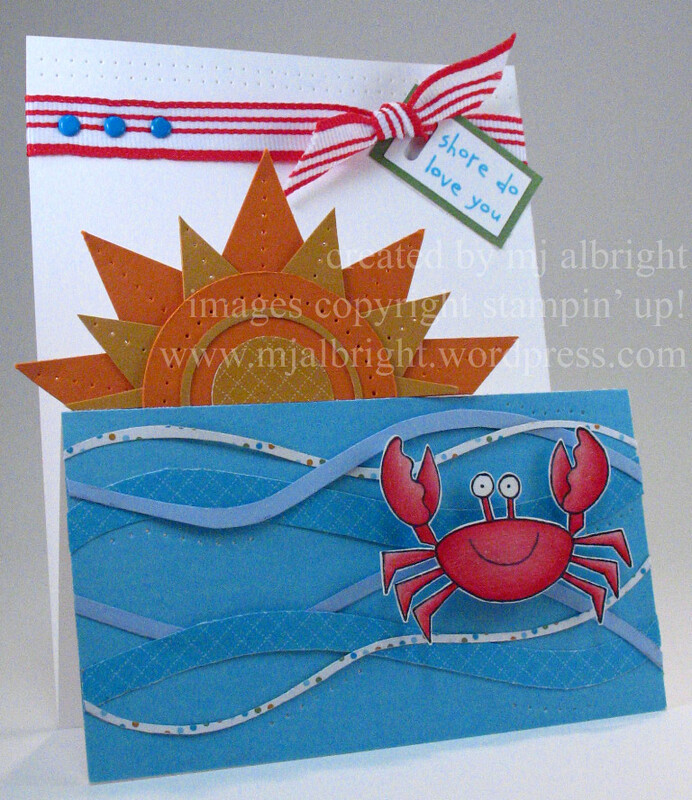 Like the tutorial suggests, I used a real red button from my bold brights assortment for behind the crab because a penny was too big. Here is a side view of the card to show you how this card works. I used my coluzzle to cut a half circle for where the sun is. Please refer to Lauren’s post for the directions to make this card. STAMPS: SU! 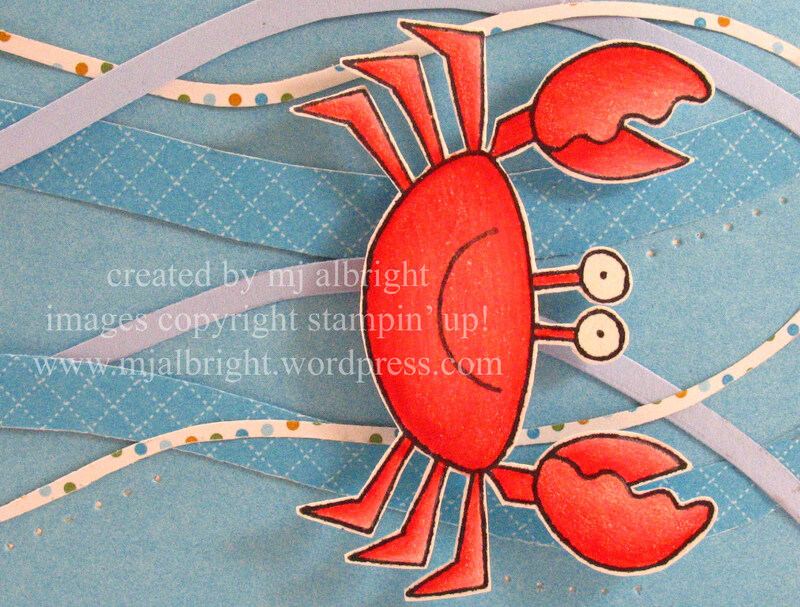 Crab & Co.
CARDSTOCK: Whisper White, Pumpkin Pie, Shimmery White, Bashful Blue, East Coast Prep DSP. INKS USED: Tempting Turquoise, Real Red. ACCESSORIES USED: Bold Brights Brads, Mat Pack, Real Red Striped Grosgrain Ribbon, Horizontal Slot Punch, Coluzzle Cutting System, 1-1/4″ & 1-3/8″ Circle Punches, Bold Brights Buttons, Stampin’ Dimensionals. Let me start by saying that I hardly ever tear paper on my cards. Not that I don’t like it. Some of the papers are very pretty that I have a hard time tearing them. The MFT stamp set will be a mini released in June titled “What’s up Cupcake?”. Love it! Wait till you see all the fun things for those cupcakes:) I added K&Co. adhesive rhinestones and Ranger Icicle Stickles to my yummy cupcakes. The patterned paper is Day Dream Check Her Out by My Mind’s Eye. The large decorative brad to the lower left corner is Just Corina by Prima. The light blue grosgrain ribbon is by American Crafts. Hip Hip Hooray for Friday! 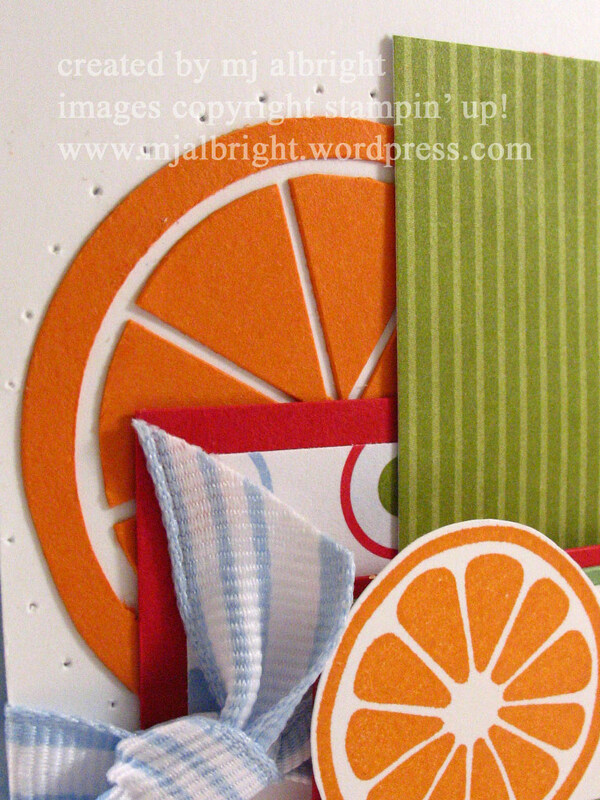 I wanted to make a bright card for Beate’s wsc. I thought it would be a cute one to leave in the console of my hubby’s car with a healthy orange for a snack. I just received my copy of Paper Crafts Magazine in the mail this past week. 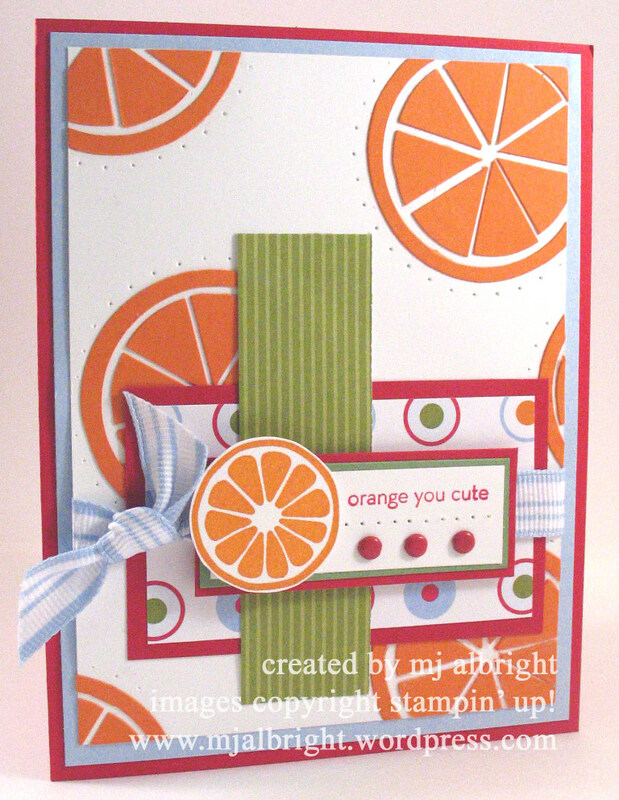 I instantly fell in love with the idea on page 45 (orange you sweet card created by Kim Frantz…I hope I’m giving credit to the correct person). I created my background oranges using the Circle Coluzzle Cutting System. 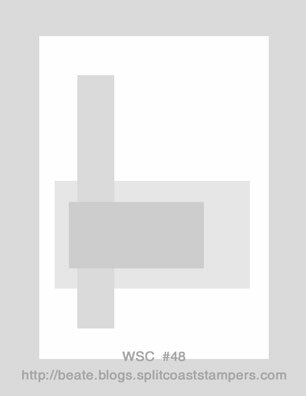 CARDSTOCK: Real Red, Bashful Blue, Whisper White, Pumpkin Pie, Wild Wasabi. Summer Picnic DSP. 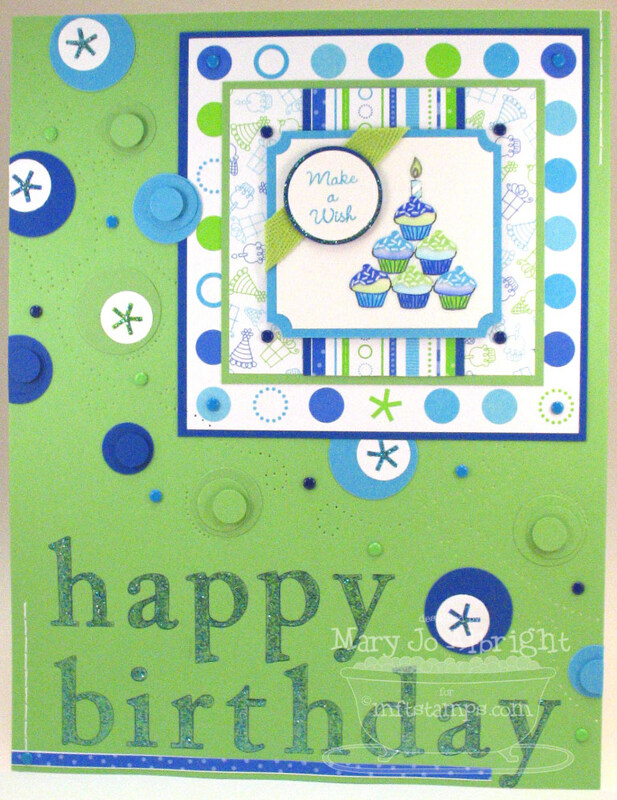 ACCESSORIES: Bold Brights Brads, Coluzzle Cutting System, Bashful Blue Striped Ribbon, Stampin’ Dimensionals, Mat Pack.